Renew yourself and get prepared for the special days. Earn rewards with the purchases you make at Walgreens, check out a great range of products in the beauty section. 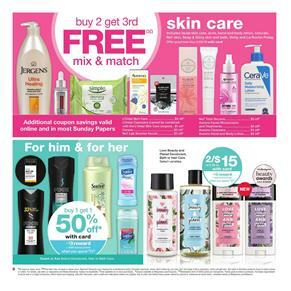 Buy 2 Get 3rd Free mix and match sale is for L'oreal skin care products. There are also coupons that will lower the prices of L'Oreal, Jergens, Aveeno, CeraVe and more brands. Visit pg 11 for the details of these products. Go to the official page of this ad for the purchasable items. Buy gifts for him and her from the deodorant section. Get $3 reward on your purchase of Axe, Suave deodorants which are BOGO 50% off deal this week. Another $3 reward is possible to earn with purchasing 2 of Love Beauty and Planet deodorant, bath or hair care. Coupon savings on hair care products is another subject about Walgreens beauty sale. It covers Garnier, Schwarzkopf, L'Oreal, and more brands. Masters of beauty are the covered brands in the latest Walgreens Ad which is a preview of the sales that will be valid on February 10 - 16. BOGO 50% off deal is valid on Aveeno bath, shave or baby products. Buy 2 of baby care products for only $18 on the same page. Walgreens ad also has a corner of makeup products including nail polish, lipsticks, shampoo, and fragrance on pg 13-14. That's a bargain with a $5 reward for your $50 purchase in these products.